Reproduced by permission of the Librarian, Maynooth University, from the collections of St. Patrick's College, Maynooth. Day 5 and our last session of SWIFT 2018 – two demos, authors’ chair and goodbyes (for now). The final log of the week was read by Katie who recounted her key moments from day 4. It’s such a pleasure to hear a personal perspective on the day’s learning and to share again in fun and humour. Thank you, Katie, for volunteering so willingly. After the log, Amy, a post primary English teacher, demonstrated exercises in ‘found poetry’, personal writing and six-word stories. The found poetry was new to me and provided a fun and entertaining way of constructing a poem and thinking about language and meaning. Amy explained that it works particularly well for reluctant writers and can be combined with white space for those who want to add drawings. Found poetry involves creating a poem using words and/or phrases from another text e.g. a prose piece. Amy gave us an example handout and then two pages each from a novel. We had to write a poem using only what was available in the prose piece – like a word collage. Small words can be added like ‘the’, or tenses changed, but the poem must be found from the original text and must be meaningful. I really enjoyed the exercise and reading my effort in a small group. One of our group, Marina, read her found poem ‘Togaless Yoga’ to all – our minds boggled. Thank you, Amy, for an interesting and informative demo. Next, we enjoyed a break and a chat, and then came the final demo of SWIFT 2018. It was a cracker. 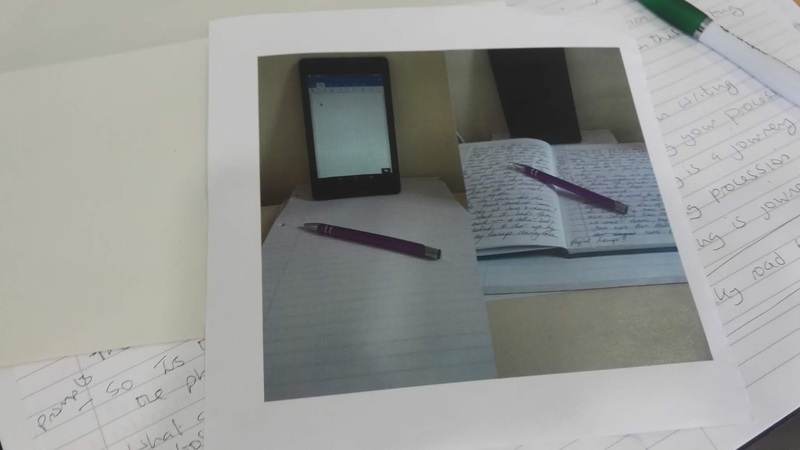 Hilde, who teaches adults, demonstrated use of photovoice. She adapted a three-month project into an hour-long session for us that was fun and gave a sense of the method. She explained photovoice, which is use of photos taken by participants to generate themes, discussion, interpretation and meaning. It was developed by Caroline Wang and Mary Ann Burris to help express community needs, problems and desires. It is highly participatory, action based and often has a social justice agenda. It is a very flexible and collaborative approach. Hilde had previously asked SWIFT participants to send her 2 or 3 photos each that represented their week at SWIFT. She put us into 3 groups of 4-5 people and gave us a pack of participant photos (different by group). She asked us to discuss the images as a group and to decide on one overarching theme. The exercise was both entertaining and enlightening, as we strived as a group to make meaning from about 10 different images. Somehow, in the end, we found a beginning, middle and end – we made a story. 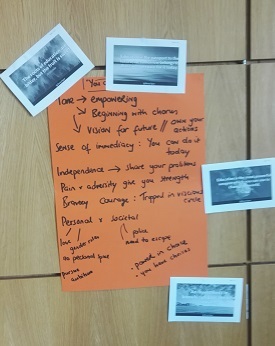 Our small group theme was ‘journey to inner peace’. Next, all small groups shared what they had created and their overall theme. As a full group, we discussed and picked one overarching theme to work on. We chose ‘Rocky Road to Revelations’. Using this theme, we each chose one image to work on individually and as a prompt to write a few lines. Now came the fun bit. Hilde had put all the images on a Powerpoint – she removed any images not chosen as prompts for our lines. We ended by playing the Powerpoint of images, and taking it in turns to read our newly written lines as our image appeared on the screen. Thank you, Hilde, for an insightful glimpse at the power of photovoice. I’m already thinking of ways that I might use it in higher education classes. And so, all things must come to an end. Before we parted, we enjoyed one final highlight of SWIFT – authors’ chair. Our final gathering was to celebrate our writing efforts by listening to readings from the volunteers in our pop-up writing groups. What a treat. Thank you, Ellie, Lorraine, Katie and Katie (yes, two Katies) for sharing your work. We heard about sibling rivalry over Easter eggs that ended in a bitter, dark chocolate tragedy. This was followed by the properly dark tale of an abused boy and man (with the ghost of a school mistress in the mix). Then the clever and funny tale of a man struggling with the embarrassment of retaining a strong Catholic faith despite desperately trialling atheism. And finally, we were treated to the WIP first chapter of an emerging novel. Exciting to think of the influences of SWIFT, now and in the future. Before we went our separate ways, I managed a conversation with Anne Marie about her student rap demo on day 2. She will tell her class that we were all blown away by their Dublin rap – hooray to involving new genres and new voices in the teaching of writing. As usual, we started the day with the daily log. This had been completed, after much thought, by Michelle. She explained first how she’d stressed over writing it – the blank page syndrome from yesterday. She had put the white page aside until early morning, when the deadline loomed, and somehow she got it written just on time. She reminded us of the fun, learning and food from yesterday. A key resource she highlighted was the paragraph matrix from our visiting Royal Literary Fund (FLF) fellow Katie Grant who had yesterday described the RLF Bridge scheme running in collaboration with RLF and Scottish schools https://www.rlf.org.uk/education/bridge/ Thank you Michelle. After our log, we had some time for reflective journaling on our thoughts from the previous day’s learning. Then Patrick started his post primary demo on use of book clubs and a flipped classroom approach to a junior cycle novel. He has used and developed this idea over time. The novel he demonstrated was ‘The Outsider’ by S.E. Hinton. Patrick advised that some novels were more suitable for this approach than others, as it relies on students reading chapters from the book as homework rather than reading texts in class. Class time is used for small group and whole class discussion and note making. Patrick spends a number of lessons setting up the book club, explaining rationale, rules and expectations, the importance of the independent learning approach, and how this will develop numerous key skills at junior cycle. The book club then works across 12 lessons where homework reading is given prior to class, and pupils discuss the readings in structured groups based on question prompts. Each group member takes on one of four roles: chairperson, secretary, spokesperson or investigator. I had encountered and used the first three, but not the last. The investigator is asked to be mindful of evidence being used from the text to back up claims, and also, to question other groups on their assertions once the class discussion begins. Each group negotiates roles and then works on a question for 15 minutes. The spokesperson then relates the findings of the group during the whole class discussion which follows. 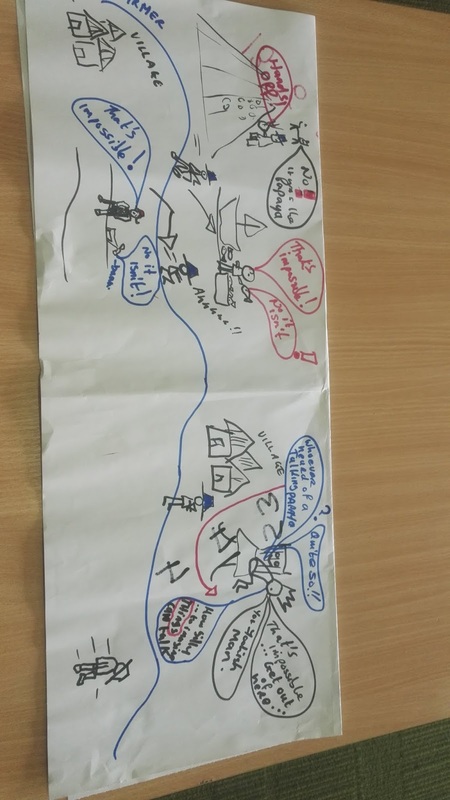 Pupils are encouraged to take notes during this process and to develop their own set of notes based on the text and class discussion and findings. The approach is collaborative, active, peer-driven, and helps to develop critical thinking (pupils must address ‘why?’ and justify their assertions). It can also be developed to incorporate writing tasks for the junior cycle portfolio assessment. 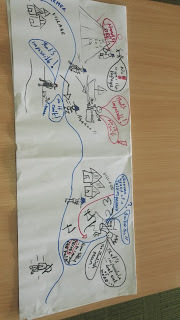 Thank you, Patrick, for an interesting and insightful demo and for asking us to trial working in small groups using the roles above and an excerpt from the text. It was fun and informative. After the morning break, it was time for our SWIFT pop-up writing groups. Alison had re-drafted a set of writing group guidelines based on a participant discussion on day 2 – these would form the ground rules for each group. All participants were allocated to a group of four or five to spend an hour reading aloud one piece of work and giving and receiving feedback. The groups dispersed around the building to find a quiet spot to read and listen. Tomorrow, at least two from each group will read their work at authors’ chair. That’s another SWIFT highlight. And finally, a special treat to end the afternoon. 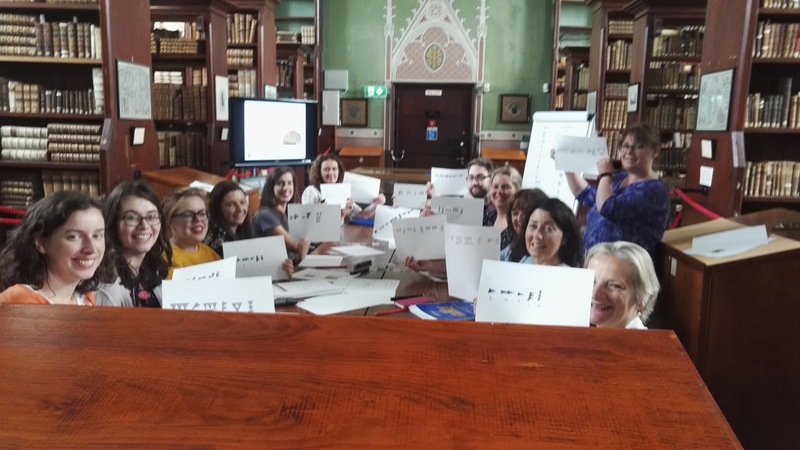 This year, again, Alison had arranged a visit to the Russell Library on the south campus which is housed in St. Patrick’s College, Maynooth. By appointment for an hour, we had a presentation on key artefacts held in the library collection and their significance. 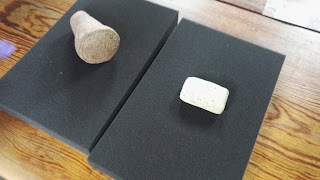 Thank you to the library staff, and particularly, Barbara McCormack, who presented to us on the cuneiform tablets and cones – the Russell Library holds the second largest collection in Ireland. We also had fun writing our names in cuneiform – the oldest written language in the world. What a beautiful place indeed. Tomorrow is the last day. I don’t believe it. So, day 3 of SWIFT has traditionally been in the lovely Maynooth University Library on the south campus. I arrive to find most of the participants merrily chatting away over coffee. I think we’ve all aced the chew and chat sessions this year. The library staff have made us very snazzy ‘SWIFT 2018’ signs, and after 5 years of SWIFT, surely even I can’t get lost. First up is the daily log, and we’re in for a treat and a half. Louise guided us back through yesterday’s high points with wonderful humour and observations. She described how writing on pen and paper was so different from her usual computer writing and how each word seemed to matter more and was mulled over before committal: ‘writing is thinking tidied up’. Her experience of the panel discussion was likened to watching a fish bowl and wanting to dive in to try out her own ideas on writing transfer and the Leaving Cert. Thank you, Louise, for such an entertaining and insightful log. After the log, we had quite a bit of personal writing time to work on a piece of our choosing. There was that lovely, almost silence one can achieve in a library - just enough soft noise to know that writing is in progress. This was followed by a break and the best chocolate chip cookies. Did I mention that we’re very good at chew and chat? Next up was a demo from Bríd on teaching academic writing to adults who are early school leavers and back to education. She introduced us to the term ‘Cogenerative Dialogue Resources’ which means letting group discussion form the basis of the class and co-construction of learning. Our tasks were to answer a question about our own writing processes and style, and to read and discuss a sample of academic writing - both tasks were in small groups first, with feedback to the whole class. Oh what feedback and discussions these prompts provoked - from creating space and time to write, to Hilde’s creative solution (when all around is chaos) of making a writing den, with a blanket, on your settee. The different approaches were aired: deadline good or deadline bad or making your own deadlines; taking frequent breaks or not; a special room as a privilege or as a trap; the connection between reading and writing. The writing samples also sparked an interesting discussion on the dryness and jargon-loaded nature of some academic writing which led to a consensus that we needed to be careful in choosing texts for students by prioritising clarity. The session closed with feedback to Bríd assisted by Katie. The final session before lunch was a testament to its author Katie Grant (Royal Literary Fellow) – it was so interesting and engaging that we ignored the call of soup and sandwiches behind us and listened intently. Katie explained the history and role of the Royal Literary Fund (RLF https://www.rlf.org.uk/) in the UK and described firstly her role as a fellow in helping higher education undergraduate students with writing skills in 1 to 1 tutorials. She then settled on explaining her role as a RLF fellow in Scotland in designing, piloting and delivering a very successful school-based project called RLF Bridge. 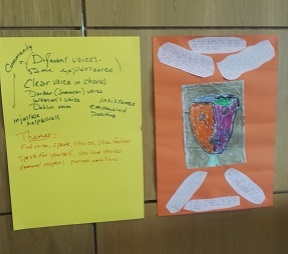 From a pilot of 10 post primary schools in Scotland, it has grown to over 80 participating schools where RLF fellows teach 5 x 50 minute workshops on academic writing development. The aim is to help with writing development including reducing fears around writing, providing vocabulary, examples and help with understanding writing terminology, and showing examples of how to structure good paragraphs. The sessions are active, fun and informative. Katie demonstrated a short story task that sparks discussion of what makes a good short story and aids critical evaluation, and she finished off with an exercise based on a paragraph matrix. It has been a pleasure to have Katie with us as both a participant and a professional writer with the many perspectives that brings to the group. After lunch, we are in for yet another treat. Alison has arranged for two visiting professional writers to discuss their writing process and engage in a Q&A session. We had one hour of chat, discussion, stories and examples that informed us and made us laugh. Thank you to both Deirdre Purcell and Sharon Tighe-Mooney. Some gems of advice: don’t strive for perfection from the outset or you will stifle ideas and words; all individuals have different writing processes and there is no one way or blueprint; something big can be developed from a very small and specific idea – pick something that resonates with you; there is no writing without reading – read widely and avidly. The rest are secrets that will remain with SWIFT fellows! Sharon’s book is non-fiction on the topic of the role of women in the catholic church ‘What About Me?’ Mercier Press https://www.mercierpress.ie/irish-books/what-about-me-/ Deirdre has written numerous books and spoke about writing fiction, memoir and non-fiction and even threw journalism into the mix. What a great day 3. Roll on day 4. Day 2 begins with the daily log provided by Mags – brave heart! Mags recounts our day and provides insights into those elements that particularly struck her. Following the log we have time to journal before Tuesday’s demo which is provided by Anne-Marie. Anne Marie works in Finglas, in Dublin, with early school leavers and students from disadvantaged backgrounds. Her demo centres around rap and how she has used rap to connect with the students and to genuinely begin where they are. By her own admission she knew nothing about rap before she threw herself into this new world guided by her class, some of whom were pretty expert in the genre. After the coffee break we talk about writing groups: how they work at SWIFT and participants’ experiences of them. A bunch of “volunteers” role play the writing group from hell which stars a cheerleader, a writing mechanics nut, and a piggy backer, amongst other characters. Their authenticity is unnerving J We spend the time before lunch agreeing what Louise subsequently calls the ‘compromised rules’ based on draft writing group guidelines. Our day finishes all too soon. I feel, as I always do by Day 2, relieved that we are hitting our stride and incredibly privileged to be a part of this very special week. SWIFT 2018 - kick off!